"Hesse State is South Korea's most important trade partner among the European provinces," said Minister President Roland Koch of Germany's Hesse State in an investment seminar recently held in Seoul. "Korean companies exported to the state goods worth 4 billion Euro (some 5.1 billion US dollars)." In the seminar held at the Millennium Seoul Hilton on May 8, 2006 Mr. Koch pointed out that his state was most favored by South Korean companies, saying that in 2005 South Korea was the world's sixth largest trade partner only after England. During the seminar Mr. Koch thanked South Korean firms for this remarkable achievement. 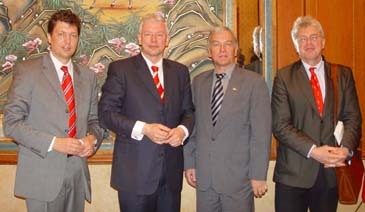 The leader of Hesse State visited South Korea from May 7 to May 9, 2006, leading his trade delegation comprising 55 German businesspeople including local Korean businessmen. According to Mr. Koch, currently over 200 South Korean companies are operating in the State of Hesse, which accounts for 70 percent of all the Korean firms scattered around the entire German territory. Korean firms in the German state includes Samsung's European headquarters in Schwalbach im Taunus, Hyundai Motor Company's design center in Ruesselsheim, Kia Motors'design center in Frankfurt, and LG International in Sulzbach. Not only major South Korean banks have branches in Frankfurt but also Korean government has its Consulate General and branch office of Korea International Trade Association in the financial hub of Europe's economic powerhouse. The Korean Community Association in Hesse is Europe's largest Korean community with some 7,000 Korean residents dispersed around Hesse. Mr. Koch continued to say that half of South Korean investors focused on the State of Hesse because of its geographic location as the center of Germany and Europe. Active supports from the state government is also a huge advantage for the Korean investors. German companies in Hesse exported about 640,000,000 Euro's worth of goods to South Korea in 2005. To the State of Hesse South Korea is the 18th largest importer in the world. Its export items to South Korea include chemical products, pharmaceutical products, machinery, automobiles, and auto parts. In the center of its active trade relations with South Korea is Frankfurt International Airport, which, as Europe's super-efficient hub, handles the largest number of transfer passengers in Europe. The airport has as many as 68,000 employees. Currently, there are 25 non-stop flights in operation per week between Seoul's Incheon International Airport and Frankfurt Airport. 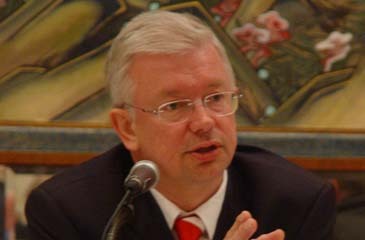 Mr. Koch also mentioned academic excellence of Hesse and the close academic relations between his state and South Korea. Five universities and four junior colleges in Hesse cooperate with 13 South Korean universities. Within about one hour drive from Frankfurt are 17 universities. Mr. Koch and his trade delegation's visit to Seoul is aimed at supporting business ties between the State of Hesse and South Korea. On May 9, 2006 Mr. Koch and his delegations went to China where they stayed until May 15. In particular, Mr. Koch wanted to publicize among the Korean businesses the advantages of doing business in Hesse. Hesse has perfect conditions for starting business with the state's high standard of living, steady economic growth. The state's sustainable economic policy guarantees high profits and safety for foreign businesses. Hesse's state-of-the-art environmental protection technology, well-developed infrastructure, energy saving and conservation of nature could mean a lot to South Korean businesses, according to Mr. Koch. He said that his state would introduce its renewable energy technology at International Green Energy EXPO Korea 2006 to be held in Daegu from June 14 to 16, 2006.